You're not a spammer. You're someone who needs to communicate with a large list of clients or subscribers. Plenty of services promise to simplify bulk emails for your email marketing campaign, but the best solution might be a tool you’re already using every day. 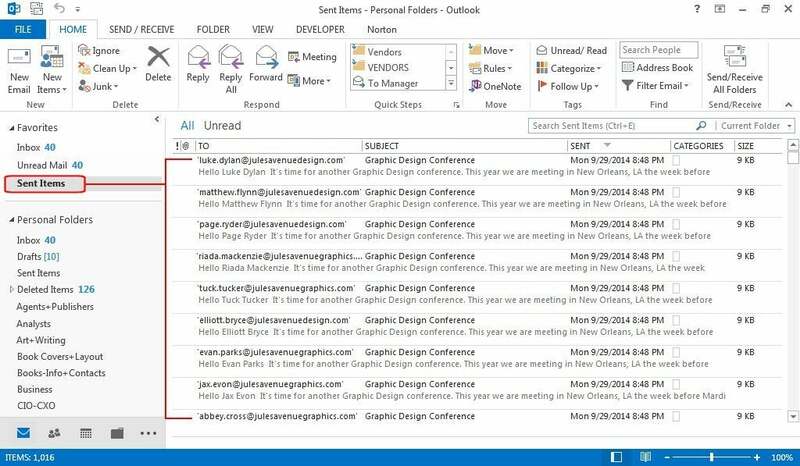 Microsoft Outlook 2013 leverages Microsoft Word’s Mail Merge capabilities to create emails that have the same message but different recipients. And, as with Mail Merge, you can customize the email with information from any field in your address book. The next time you have to send a newsletter or other bulk email, follow these steps. 1. From the Navigation Pane at the bottom of the Home tab in Outlook, click People (this may be spelled out in text or represented by the two-headed “People” icon, depending on your Navigation Pane settings). Scroll through your contact list, hold down the CTRL key, and click each person you want to receive this bulk message. Names turn blue when selected. Select the message recipients from your contact list. Document File: New Document or an Existing Document. If you choose Existing Document, you'll need to click the Browse button, locate the document, and click Open. 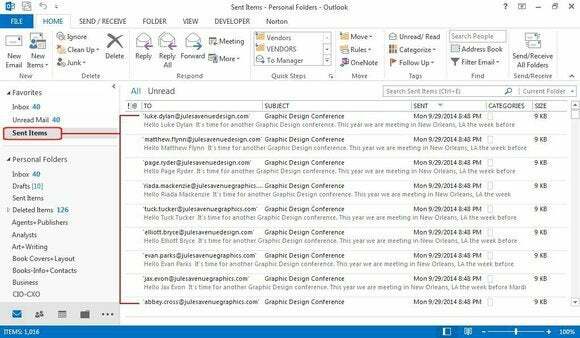 For a New Document, Outlook launches Word so you can type your new message. Contact Data File: If you plan to use this message again, check the Permanent File box, then browse to locate the file, or enter a filename. Merge Options: For the Document Type, choose Form Letters. Note: You can also merge Mailing Labels, Envelopes, or a Catalog. For Merge To, be sure you choose E-Mail. Message Subject Line: Enter a subject for your email here, then click OK.
1. As soon as you click OK, Outlook opens Word. 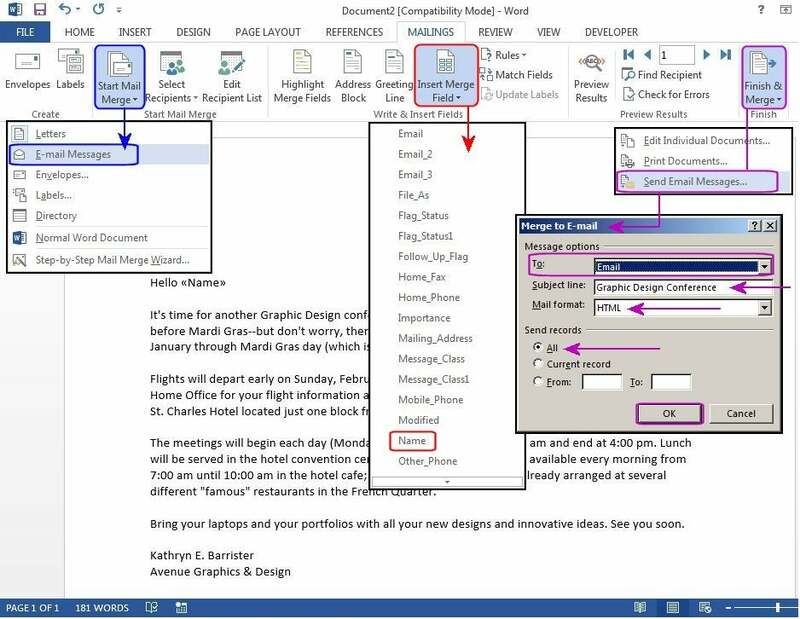 Compose the body of your message, place your cursor on the salutation line and type Hello, then click the Insert Merge Field button from the Write & Insert Fields group. Select Name from the drop-down menu and Word inserts the email field <<Name>> beside the salutation. 2. You can insert other fields inside the body of the email such as phone, company name, and job title. But what if you need to add some custom data that doesn't have a related field? You can borrow one. Say you wanted to send clients invoice reminder emails that listed the balance due on their accounts. There's no field in Outlook for that, but the Phone Numbers fields have 19 options for input and four field boxes for display. One of the options is Other. Select this option and enter the balance due there. Then in your message, position your cursor where you want the balance due to display, click the Insert Merge Field button from the Write & Insert Fields group, and select Other from the dropdown menu. Word will insert the email field <<Other>> and fill that field with the dollar amount you entered in your Outlook contact list for each record merged. Create the message, merge with your contact list, and send it. 3. When you're satisfied with the message, click the Start Mail Merge button and choose Email Messages from the dropdown menu. Word merges the emails and displays the format on the screen. Next, click Finish & Merge from the Finish group and select Send Email Messages from the dropdown menu. 4. 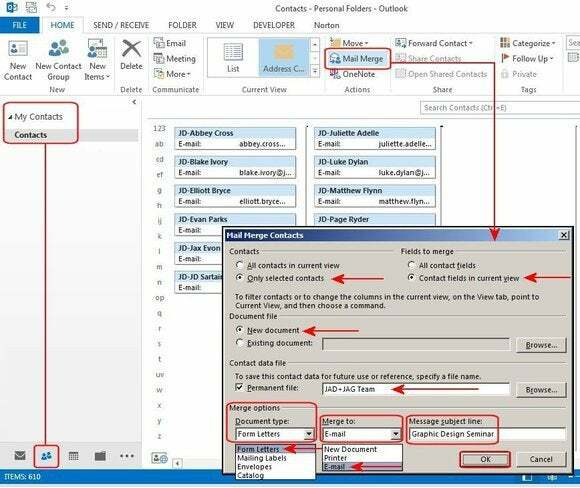 In the Merge to Email dialog box choose Email for the To field. Next, change or enter a new subject on the Subject Line, then select HTML as the Format. 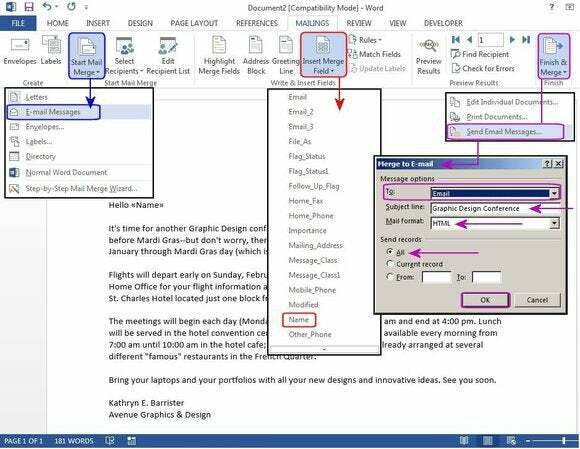 Under Send Records, choose All if you want to send all the emails at once, Current Record if you want only to send the currently selected email, or enter a range of records/recipients, then click OK. Word and Outlook merge the emails and send them out. Go back to Outlook and select the Send folder to review the results. If it was a successful merge, there should be one email for each recipient sent to their email address with their name on the salutation line of the message. Review your Sent folder to ensure the Email Merge was a success. That’s all there is to it. Remember to check with your ISP before sending out more than 50 emails at a time, in case there are penalties—such as suspending your email account—for bulk mailings. And stay tuned for more Outlook 2013 tips.